I have a dilemma. I'm started to make a bracelet and changed a few things in my intended design. 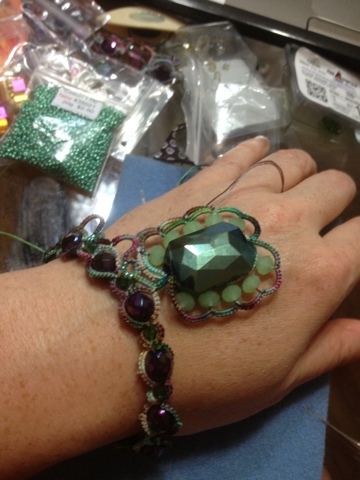 Now I can't decide whether to make a slave bracelet or a necklace. What do you think is more likely to be bid on at a silent auction? I need to decide before I go any further. Any thoughts? Necklace. That's what BC3 thinks and asked me to pass it on to you. I would prefer a necklace - but of course, it depends on the age group your prospective customers fall into! Teenagers would probably love the slave bracelet. I'd be more likely to bid on a necklace, but that's just me. Bracelets of any kind seem to get in my way, and I don't wear them much. (They slow down my tatting, I think.) See you at Tat Days soon! I'd be more likely to bid on a necklace. I rarely wear bracelets, and on the few occasions I do, they always seem to be in my way, regardless of which wrist they're on. I vote for the pendant! And those are beautiful colors and a great design! I would say a necklace as the centre stone is quite large and would look stunning on someone's neck. I'd definitely go with a pendant. The "big" stone seems a little large for the back of a hand. Neat design! I would bid on a necklace. 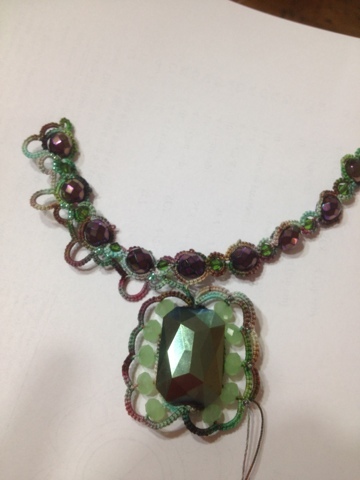 I think it would look good as a half necklace....just add chain to the sides and top with an eye and hook!